Arcade Classics is a Sega Megadrive/Genesis game featuring three classic arcade games: Pong, Missile Command, and Centipede, plus a revised Sega version of each one. You are traped in an enchanted forest. Mushrooms are poping up all over the forest floor, traping you. Buzzes and thumps fill the air. Evil eyes glare at you and quivering antenae pop out at you. It's the centipede! You grab a stick and jab it at it. Sparks fly out of the tip of it, blowing the centipede's head off. Watch as the segment behind the head becomes the head. Quick, keep jabbing at it before it gets you. Beware of spiders, who distract you from sparking the centipede, scorpions that poison the mushrooms it touches, and fleas, that fall in a straight line leaving mushrooms behind it. You control the magic wand at the bottom of the screen. it resembles a space ship of some kind. Use the D-paad to move. Press the B or C buttons to shoot. The spider tries to distract you from shooting at the centipede. The flea appears when most of the mushrooms are destroyed, droping in a straight line leaving mushrooms behind it as it falls. When you shoot it once, it drops twice as fast. The scorpion crawls across the middle of the screen poisoning every mushroom it touches. The centipede is the main target. It starts at the top of the screen and crawls left or right, moving down and changing its direction when it hits the edge of the screen or a mushroom. When it hits a poisoned mushroom (which are a different color from the other mushrooms) the centipede plunges downward until it hits the bottom. The Krytolians are attacking the Zargonians with interplanitary ballistic missiles (IBMs)! The Zargonians are scilled fighters and counter with their Antiballistic Missiles (ABMs). It takes skill to control them. Are you up to the challenge? You must defend six cities and your missile base. Use the sight to target where your ABMs are going to hit. Your best bet would be to shoot your ABMs in front of the IBM's path to destroy it. Use the D-pad to move the sight. 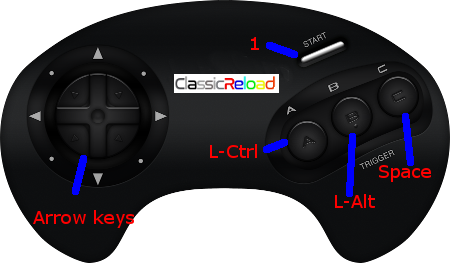 use the B or C buttons to shoot. Use the D-pad Up or Down to move your paddle to block the ball from getting past you.